Evanger’s Dog Food Recalled Across US for Containing Euthanasia Drug! 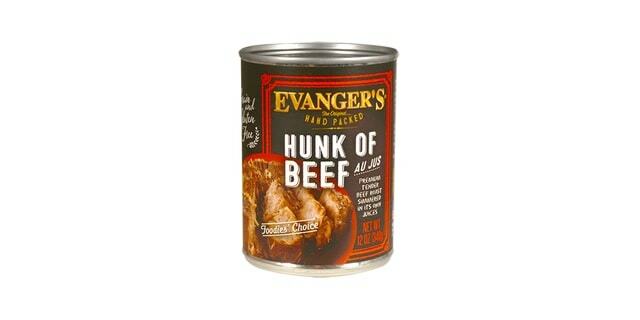 Evanger’s is recalling their premium brand beef dog food, after discovering there was a euthanasia drug found in it. Dogs became immediately sick after eating the food, and one dog has died from it already. An investigation into how the drug got into the dog food is underway, but anyone with this particular brand of dog food is urged to discontinue use immediately, and return it to the store. Somehow, sodium pentobarbital made its way into the “Hunk of Beef” cans of dog food. The drug is sometimes used to control seizures and help with insomnia in humans. However, the drug is used for euthanasia in cats, dogs, other small animals, and even humans in some states, and is not at all something that you want to feed your pet. The drug can also be used in livestock, but is supposedly NEVER used for livestock intended for consumption because of health risks. This is why it’s so strange that this particular drug found its way into the food. As mentioned, the company is investigating what happened, and so far, they believe that it may have come from their beef supplier. The seriousness of the situation was brought to the company’s attention after a family in Washington State fed some of the tainted food to their four dogs, and every one of them got very ill right after. One of them even died, and the other three wound up in intensive care. As of the writing of this article, these are the only cases known to be directly caused from the food. The following states have received the tainted food: Washington, California, Minnesota, Illinois, Indiana, Michigan, Wisconsin, Ohio, Pennsylvania, New York, Massachusetts, Maryland, South Carolina, Georgia, and Florida. All affected cans will contain the following LOT#’s: 1816E03HB, 1816E04HB, 1816E06HB, 1816E07HB, and 1816E13HB. If you have any cans of this flavor of their food, return them to the store for a refund. If you have any questions about the recall, contact Evanger’s customer service at 1-847-537-0102. Dog So Happy to Be Rescued That She Split Her Tail Wagging It Has Now Been Adopted!